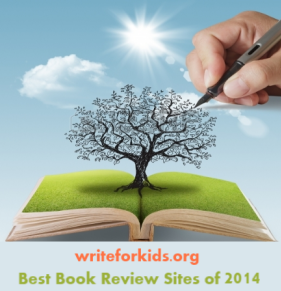 The reviewer received a copy of the book from the Moving Windmills Project. You've heard the saying, "One person can make a difference." It sounds cliche, but it's true. 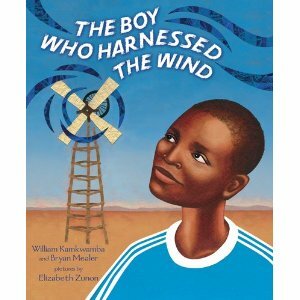 If you need evidence, look no further than the picture book biography, The Boy Who Harnessed the Wind. William Kamkwamba and Bryan Mealer collaborated to tell the amazing story of how William brought electricity and irrigation to his drought-stricken village in Malawi. William's family grew maize and tobacco in central Malawi; they relied on these crops for food and income. When a drought hit the country, the family had to cut back to one meal per day. There was no money to pay fees for William to attend school. William, a curious and inventive young man, spent his free time at the local library reading books about science. When William came across a photo of a windmill and learned that it could be used create electricity and pump water, he saw a solution to his family's problems. Using a tractor fan, pipe, bolts and other parts he found in a junk yard, William built a windmill that generated enough electricity to run a light bulb. He knew this was just the beginning; his goal was to use windmills to pump water up from the ground to irrigate the fields.What a great example for kids about the power of books and reading. The authors use dialogue and incorporate words from the Chichewa language to create an engaging story that will inspire young readers. "Wachitabwina!" a man yelled. "Well done." William knew he had just begun. creating food where once there was none. Magesti a mphero- electric wind- can feed my country, William thought. Oil paint and cut-paper collage illustrations work perfectly with the text to convey William's story. Rich, earth tones are used to illustrate the land and sky. One illustration shows a deep purple sky in the background while William's family sits around a lantern sharing a meal. On a two-page spread, layers of yellow and orange paper illustrate a sun shining down upon dry, barren land made of textured paper. Later in the story, blue paper with swirled designs are placed around a windmill to illustrate the wind while people pick maize in lush green fields. An author's note in the back of the book provides more details for readers eager to learn more about William (now a student at Dartmouth) and how he constructed the windmill. I'm looking forward to sharing this powerful story with the readers in my library. Pair this book with Planting the Mangrove Tree: Planting Trees to Feed Families by Susan L. Roth or Energy Island by Allan Drummond. This sounds like an important story. And well written. This looks really neat. Thanks for sharing this book... I think it will inspire kids.